Build on the skills from Defensive Handgun 1 to move further down the pathway to confidence. This class will cover how to clear common pistol malfunctions, reloading, and shooting with your dominant and non-dominant hand only. On the range students will be drawing from concealment, practicing drills involving target identification and accuracy with time constraints. Reloading during drills as well as one handed shooting will be additional skills practiced on the range. Ready to sign up? 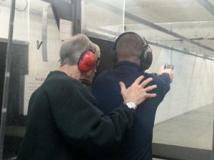 Click here to see all of our Defensive Handgun 2 classes.